After they’re born, babies must breathe continuously to get oxygen. In a premature baby, the part of the central nervous system that controls breathing is not yet mature enough to allow nonstop breathing. This causes large bursts of breath, followed by periods of shallow breathing or stopped breathing, known as apnea of prematurity. When this occurs, babies often require a form of assisted breathing called nasal continuous positive airway pressure (CPAP). The pressure from the CPAP machine helps keep preemies’ lungs open so they can breathe on their own. 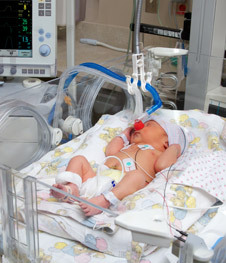 With the addition of the infant CPAPs, premature babies no longer must be transferred to out-of-town pediatric hospitals for access to life-saving treatment. Newborns can now remain in our community without separation from their moms and dads while they receive the specialized care they need. Premature infants lack the body fat necessary to maintain their body temperatures. Their skin is very thin and its moisture evaporates very quickly. These babies are also vulnerable to illness and infection. The Giraffe® bed is a microenvironment for these infants. The bed is named “giraffe” because of its long neck that can go up or down at the push of a button. Through an innovative design and advanced technology, The Giraffe® bed serves as an incubator, radiant warmer and crib all-in-one. The bed provides essential heat to maintain a normal body temperature, in either an open or closed position. Because the bed is so versatile, babies can remain in it throughout their stay without the stress of being moved from bed to bed. 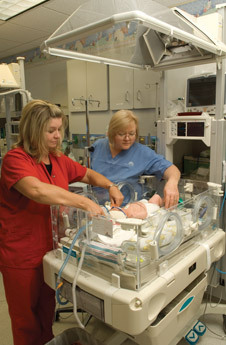 An infant ventilator is used with babies who have difficulty breathing on their own. The ventilator provides air to the baby through a tube inserted into the trachea, with adjustable settings to allow care providers to control how much air is delivered and how much pressure is involved. As the baby improves, the care team can start weaning the infant off the ventilator, allowing the baby to breathe independently. 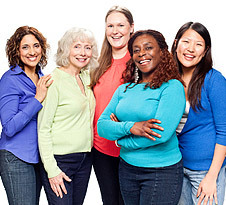 Prenatal classes and tours of the unit are available monthly. Reservations can be made for both by contacting Call-A-Nurse at (800) 982-9799 or (940) 764-8570.